Jenni will work on developing fine motor skills such as grasp and release of a paint roller and exploring the texture of a pipe cleaner ‘feeler’ for the butterfly. Jenni needs co-active assistance to hold and use a paint roller to apply paint to the butterfly. Her helper in special education art class needs to focus on her developing fine motor skills and goals in this area, and allow time for her to work towards these goals. Although this may be an easy art project in terms of the artistic product, it is still a useful vehicle for helping students in developing fine motor skills, communication, social skills or any other parameters that are areas of need for your student group. The first step in this easy art project in teaching students with disabilities is to paint the white paper with the bright colored paints, using whatever design takes your fancy (and that of your students!). Invite your students to explore and experiment with different effects, such as swirls, dots, lines, or blending of colors together. Once the paper is covered, fold it in half so the two painted sides meet together. Ask students to pat the paper so the paints blend together, then gently peel the paper open again. This is a great task for developing fine motor skills – too hard and the paper may rip, but too soft and the paint won’t blend completely. 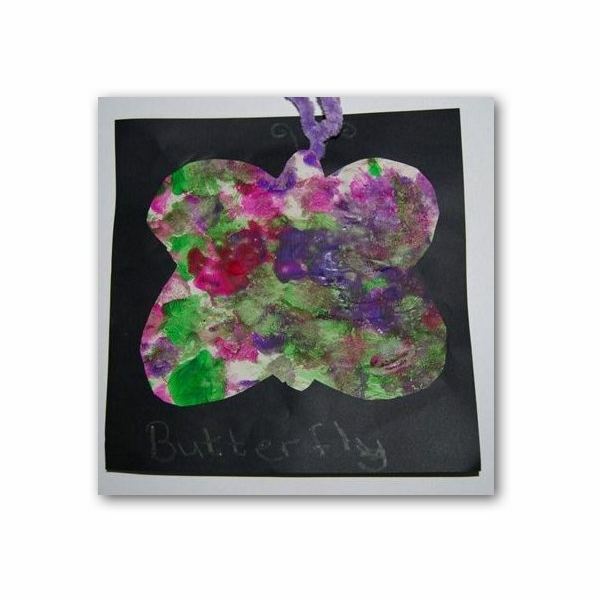 When the paint is dry, draw a rough butterfly shape on the reverse side, then cut it out with safety scissors, board mounted scissors or other tools used by your students. Remember that students who are developing fine motor skills may have imperfect abilities when it comes to making contact with their hand on a pair of scissors, so always allow room or error and encourage students to approach complex tasks such as holding and using a pair of scissors when they are fresh and focused, not when they are tired and frustrated. Paste the butterfly onto the black paper, then poke a hole near the top with a pencil. Thread through a pipe cleaner folded in half so you have two pipe cleaner ends poking out on the front side of the butterfly. Twist them slightly to give a curled ‘feeler’ effect. Add some eyes or any other decorations you like, then display the butterflies on the wall, or as part of a large class mural. This easy art project is great as part of a theme on forests, the tropics, insects or seasons.